As the book was launching, I told my mother that I had a feeling that when I looked back at the end of my days, this book was going to be one of the accomplishments I was most proud of. Little did I think at that time that my days might be numbered on one hand. Two days ago, my 12 year-old-son disobeyed a rule. He’s not supposed to leave the yard without letting me know where he’s going. We live in a rural area with woods, swamps, ponds and a small grass landing strip across the road. When going for a walk, you can strike out in just about any direction. And it’s not that I don’t want him leaving the property, but that I want to know where he is if I need to find him. He had a friend over on Sunday, and they asked to go for a walk. It was fine with me, and they left and came back with no issues. But then, apparently, they left again without telling me. When I looked for them later, they were nowhere to be found. That unintentional choice almost cost me my life. Despite the cool temperatures, I managed to find the one and only (I’m sure) half-alive, but alive enough, bumblebee in the entire neighborhood, and stuck my foot right into its stinger. For many people, that may not seem like a big deal. But the last time I was stung, 13 years ago, I was told the next time would be my last if I didn’t get immediate medical attention. Here I was, ¾ of a mile away from home, no one knowing where I was, and off the beaten track. There was no immediate medical attention to be had, and my Epipen was at home. What could have been a fatal mistake ultimately wasn’t, or I wouldn’t be writing this to you today. I’m thankful to say, I had no fear of dying. I’m ready spiritually for when that happens. And, yes. 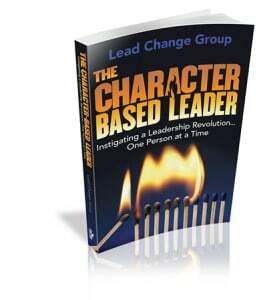 The Character-Based Leader is definitely among the proudest accomplishments of my legacy thus far. But there were two main things that forced me to persevere that day. One was that I couldn’t let my son ever feel that my death was his fault. The other was that there was someone special to me that I hadn’t told how I felt yet. Those two things gave me the purpose to persevere in a frightening and challenging situation. And within 24 hours, I’d had the conversation I needed to have with my son, and made a bumbling attempt to talk to that special someone as well. There are a few take-aways here that we can all learn from. What unintentional choices are you making that could be life-altering for you or those you love? Are there behaviors you dislike in others that need to be changed in you too? What burden do you have the power to relieve or alleviate for someone else? Is there something you haven’t shared with someone that you’d regret them never knowing? Most importantly, what legacy are you leaving that marks your path through this world? As you think through these questions and reflect on them, may they prompt changes in your life that have a lasting effect. And let me also say how very thankful I am for you, my readers, clients and friends. You make this journey called “life” a trip to be savored. I’d love you hear your thoughts on these take-aways. Do they resonate with you?